Texas psych warriors The Black Angels had a massive 2010 what with the release of their third album Phosphene Dream, the growing popularity of their own Austin Psych Fest, and a unbelievable tour co-headlined by the likeminded Black Mountain. I spoke to guitarist Christian Bland about the latest album, which showcased a mellower, more melodic nuance to the archetypal Black Angels sound. Such changes have allowed them to stretch themselves sonically. "Sure. I think some of our other influences came thru on this album. With the help of Dave Sardy we crafted shorter songs inspired by The Zombies, Beatles, Animals, etc…British invasion meets Austin psychedelia. Dave was out in LA though, so we flew to him. It was great to leave home and record in a new environment. I think you can hear LA coming through on the album. It would have sounded completely different if we had recorded in Austin." This change in scenery culminated in a decided shift in tempo, most notably on tracks 'Telephone' and 'Haunting At 1300 McKinley'. Particularly with the former though, Bland says the song pretty much wrote itself. "We wanted to try a song that had an early Beatles feel. I bought a new guitar around the time the song was written, a 12 string 355 Rickenbacker. I think the song must have been stuck in the guitar waiting for someone to get it out." The name of the album itself, Phosphene Dream, comes from a communal interest in a book they found about the drug DMT (dimethyltryptamine), a naturally occurring psychedelic compound. However Bland is quick to allay thoughts that this is a chemical album. "DMT can show you what it feels like to die and come back to life. That's what the album is about. DMT is known as 'the Spirit Molecule.' It's naturally occurring in all of us." 2010 has been a massive year, ending with touring with friends Black Mountain, whilst also returning to the UK to do their solo headliner shows. "It was great. Black Mountain...they're amazing people and very talented musicians. And I think the UK is slowly warming up to us," Bland says with a wry grin. But it hasn't all been about playing and recording, with the fourth year of their curated Austin Psych Fest seeing possibly the best line-up ever, including such Sonic Masala favourites as Atlas Sound, Dead Meadow, Crystal Stilts, Sleepy Sun, White Hills, Pontiak, Beaches, Woodsman, Young Prisms, Cloudland Canyon, and Tjutjana. However the origins of the festival were somewhat humble. "In 2008 we had the idea to invite all of our friends bands to town for a weekend of psychedelic music. It's a fun time to hang out with all of our friends and hear the best, most creative music being made today. Each year its grown and grown beyond what I would ever have expected." Bland was also quick to talk about some of the music that he thought deserved much more attention. "I think Clinic should be the biggest band in the world. They've been a huge influence on us. Another band that should be getting more recognition is The Night Beats from Seattle who will be at Austin Psych Fest 4. I also love (the Australian music scene). I've really gotten into Tame Impala. Another of my favourites is The Dolly Rocker Movement." Finally, what is Sonic Masala? "It sounds like an Indian dish!" That it does - the best kind. 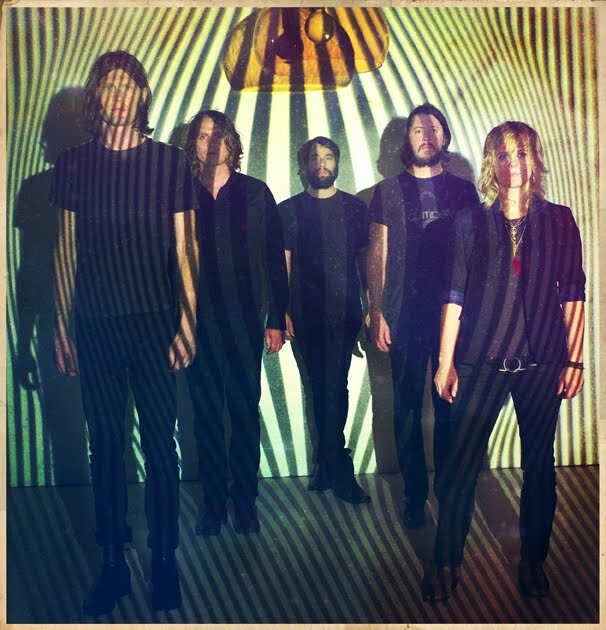 The Black Angels have just released a video for their single 'Haunting At 1300 McKinley', whilst you can still get tix for the Austin Psych Fest which is held on the final weekend in April.